The warming trend will continue Monday, as temperatures are expected to warm into the mid to upper 80s — perhaps lower 90s in some spots — for most locations across the Rio Grande Valley, according to the National Weather Service in Brownsville. Rio Grande City may reach 90 while McAllen will be 89. It will be cooler near the coast. 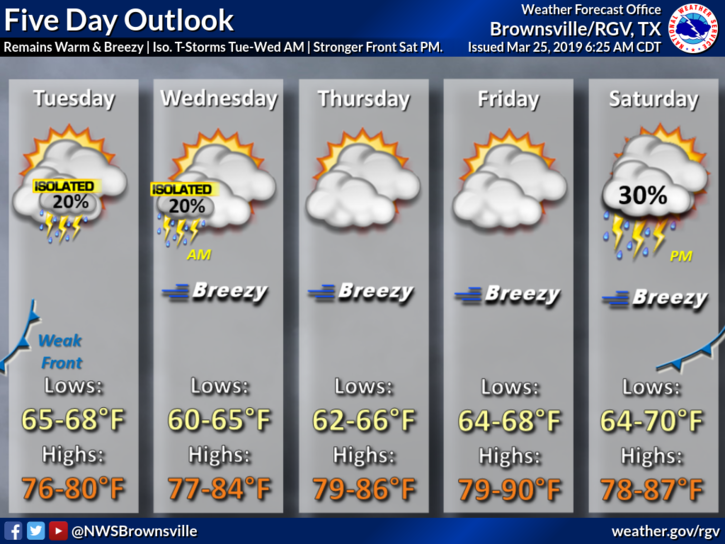 Brownsville’s high will be 84 and South Padre Island 73. Looking ahead, a weak cold front will move into the area Tuesday, dropping temps to the uppers 70s. There is also a 20 percent chance for isolated thunderstorms. The warming trend will then continue through Saturday. On Saturday night, a stronger cold front will arrive with a chance for thunderstorms.